When it comes to the US economy, there is overall consumer spending, and then there is spending on vices - a true leading indicator of overall consumer confidence and discretionary spending as Americans generally won't splurge on hookers, blackjack and blow until they are absolutely positive they won't need the cash for something else. Conveniently SouthBay Research has a "Vice Index" that that tracks spending on gambling, alcohol, drugs, and prostitution. And as of February, the vice index just tumbled, suggesting that after a brief burst in late 2017 and 2018, the consumer-driven economy is again in trouble. 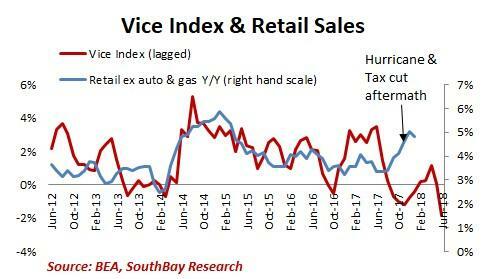 Or, as SouthBay's Andrew Zatlin writes, the "Vice Index Points to Tax Cut Hangover: Slower Pace of Consumer Spending for 1Q"
Shown below is SouthBay's proprietary Vice Index (lagged by 6 months) which tumbled in February to -2%, its worst print since 2012. Here is the same Vice Index shown unlagged: it shows that the impact of the Trump tax Cut was "Short but Sweet", and ominous warning for the broader economy. The 2016 Reflation: The US and global economies rebounded in late 2016 with a firming up of oil and materials prices, as well as the Trump election. As a function of its leading indicator qualities, the Vice Index began surging July 2016. Trump tax Cut: The Trump tax overhaul was approved in December 2017 but consumers began spending before then. Meanwhile the Vice Index began to surge October. The point being that the Vice Index is a very reliable gauge of shifts in the economy as they impact consumer spending. 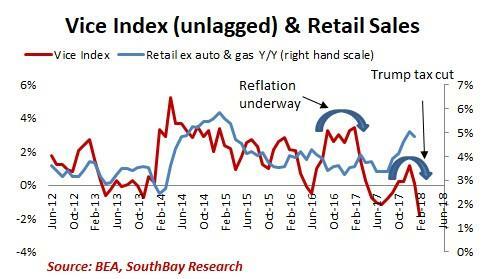 And, as Zatlin writes, "it is pointing to a sharp down turn in consumer spending. As if the Tax cut never happened." It's very possible that the pace of spending will pick up over the year. But first some household financial healing needs to take place. That's a 'permanent' 5.3% jump in disposable income. 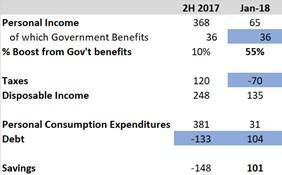 Consumers pre-spent a lot of the Trump tax cut: In anticipation of the tax cut, Households went on a spending spree. You can see that in the pace and timing of the drop in savings: a little drop in September (when the tax cut seemed likely) and a bigger drop in November when the cut was agreed. Consumers were spending ahead of the expected savings. Spending actually slowed in January: In the 2H 2017, PCE averaged $60B+ per month. In January it was half or $31B. In fact, of the January $106B gain, all but $5B went to savings. 1Q: Relatively slow pace of retail spending. There's a consumer hangover as savings get repaired and the big holiday bills get paid. 2Q: Spending resumes. By April, US households will be enjoying tax rebates and also factoring in the additional $100B per month from lower taxes and COLA. Higher interest rates and inflation will nibble away at some of this will boost spending. Spending to pick up in 2Q. It's a consumer hangover following the First the savings hole must be re-filled. Then the holiday spending bills must be re-paid. Perhaps the spending rebound will take place as expected... but first have a chat with your friendly, neighborhood drug dealer: when it comes to spending trends and inflection points in the US, he just may have the most valuable information.